Seafood and pork seem to have a natural affinity, see Shrimp & Grits, Spaghetti con Vongole & Chorizo, Roasted Halibut with Chouriço & Mushrooms and of course, Paella. This recipe, is for a perfect one-dish meal that serves 2 and can be prepared in about 45 minutes. You’ll need a large non-stick skillet, about 12 inches to give the scallops enough room to properly sear, a large deep pot for the spinach, a strainer and tongs. 1. Rinse the scallops and thoroughly dry them with paper toweling. Sprinkle one side of each scallop with paprika and let sit for 30 minutes. 2. Heat oven to 175 for warming. 3. Remove kernels from the ears of corn. 4. Slice and dice the chorizos. 5. Pre-heat skillet on high, add and melt 1 tbsp. of the butter, add the corn and sauté 4 to 5 minutes, until lightly caramelized. 6. In the meantime, bring 1 cup of water to a boil in a large pot, add the spinach. When spinach is done, drain well and transfer to oven to keep warm. 7. When the corn is done remove to a blender and process, add the cream and process again until fairly smooth. Transfer corn to a small bowl and keep warm in the oven. 8. Add the chorizo to the skillet and lightly brown. Place in oven to keep warm. 9. Get the skillet very hot and melt the remaining tbsp. of butter. When smoking add the scallops, coated side down, and sprinkle top side with paprika. Pan-sear them for 2 minutes, turn and repeat. 10. In the meantime remove the spinach, corn and chorizo from the oven and begin to assemble each serving: divide the spinach between the two bowls; top with the corn. When the scallops are done divide them between the two bowls and arrange them atop the corn. Sprinkle each bowl with the chorizos. 11. After the scallops are removed from the pan, pour in the wine, bring to a boil and deglaze the pan. Cook the wine down by about half and divide the sauce among the two bowls. Serve at once. Hi Cathie, it will not be on the menu this weekend, but Shrimp & Grits will. See you soon. This is one of my favorite dishes; and I tried them all, lucky me. 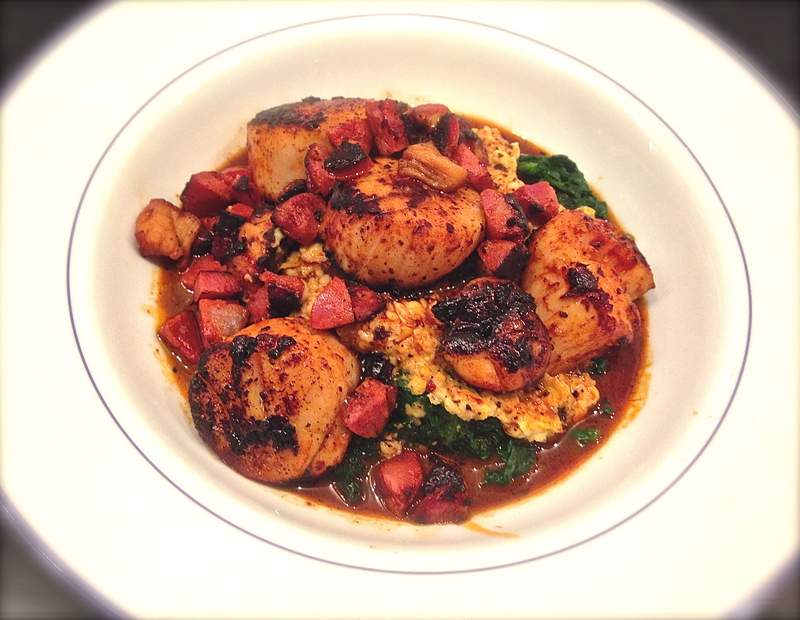 The blend of sweet corn, spinach, tangy chorizos and spicy scallops is indescribable! What a man! If you like I will email my grandmother’s recepies. What a kick are you!! Tom would be thrilled with your new adventure. Thanks Bert. Good to hear from you. If you send in some of grandma’s recipes we’ll try out a few and give her due credit. Thanks for following us. Regards to Donna.